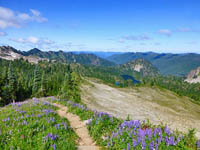 The Seven Lakes Basin - High Divide Loop runs over 18 miles through the heart of Olympic National Park's old growth forests and alpine lake country. This spectacular and commensurately popular backpacking route provides access to a lofty collection of lakes, tarns and meadows that feed the Bogachiel, Hoh and Sul Duc river valleys. The trail runs level past Sol Duc Falls (.8 miles : 1,927') to Lovers Lane (.9 miles), where the Deer Lake Trail branches south and begins a steep, rugged climb to Deer Lake (3.4 miles : 3,527'). Follow the High Divide sign left to a marshy pond and resume steady climbing in a thick subalpine forest. The trail emerges from timber at a pond (4.9 miles : 4,115'), and weaves by another into an expanding meadowland laced with streams and wildflowers. Grades moderate as you wind through an airy landscape with nice views and a good chance to see deer, bear, and grouse on open grassy slopes. The trail levels through patches of fir on a ridge, then rolls over to the south side overlooking the upper Bogachiel River Valley (6.15 miles : 4,755'). It curls east and rises up a narrow path etched into high, vertigo inducing-slopes (6.5 miles : 4,750'). The trail negotiates a rocky bowl to the Lunch Lake Trail split (7.05 miles : 4,862'), where you'll bear right toward Hoh Lake and High Divide across steep slopes that can be impassable without technical gear when covered by snow. The trail rolls briefly to the north side of a ridge with panoramas over the Seven Lakes Basin (7.65 miles : 5,280'), then back to the south side at the Hoh Lake - High Divide split (7.95 miles : 5,240'). The split is located right below Bogachiel Peak on a divisive pass between the Bogachiel and Hoh river valleys. Here you'll have great views of each, but particularly across the Hoh with a Mt Olympus and Bailey Range backdrop. The High Divide Trail turns east with access to Bogachiel Peak just steps away. It rolls on - steeply at times - for the next two miles on an airy ridge between the 7 Lakes Basin (north) and Hoh River Valley (south). Wildlife is common, particularly bear and goat. Grassy slopes are covered in summer flowers and autumn berries, while lengthy annual snow cover in some areas forms a barren rock-soil landscape. At 9.5 miles (5,277') the trail reaches one final crest on the rim of the basin, then drops quickly out and down to the Heart Lake - Cat Basin split (9.95 miles : 5,042'). From this point on you'll not take another uphill step; if you do, it might be welcome. The trail drops through broad open slopes to Heart Lake (10.3 miles : 4,744'), a spacious basin with room to explore. It crosses the outlet and begins a steady descent into a yawning valley frequented by elk. The forest progressively thickens to Sol Duc Park (11.1 miles : 4,135'), a nice campsite along Bridge Creek. A fast, rugged, twisting descent through stately fir leads to 7 Mile Bridge (12.55 miles : 3,368'), which spans a voluminous chute on the upper Sol Duc River. The trail bends NW along the river and drops with less rigor to the Appleton Pass Trail (13.25 miles : 3,082'), where subalpine forests yield to some of the largest old growth fir and hemlock in Olympic. A rocky, rooted path continues for several miles, moderating only as you near the end of the loop (17.3 miles : 1,936'). Retrace your steps back to the Sol Duc Trailhead (18.1 miles : 1,882'). Lingering snow on steep, narrow sections may be tricky (if not technical) well into summer. Ice ax and self-arrest skills may be necessary when covered. Consult the WIC for the latest trail information. Campsites, particularly between Lunch Lake and Heart Lake, fill very quickly during peak season and may be difficult to reserve. Date and itinerary flexibility is the best way to ensure desired locations. Consider traveling clockwise, and staying one night in one of the Sol Duc River sites. These sites are located in gorgeous old growth forests, are very private, and allow fires. "The road to Sol Duc is closed due to recent storm damage (as is the road to Elwha and Enchanted Valley); no word from the park on when these will reopen. Taking a beating this winter and it's only December!" "My first backpacking trip was on the High Divide Loop last year. It was one of the most breathtaking places I have been. Absolutely gorgeous in September. Trip details/photos here: http://emmaloe.blogspot.com/2014/09/four-clowns-take-over-high-divide-trail.html"